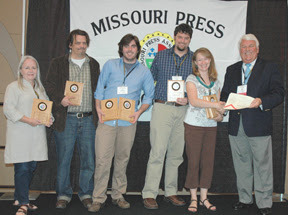 We are happy to report that your hometown newspaper, the Jackson County Advocate, received 14 awards at the Missouri Press Association’s annual conference in Branson, Missouri last Saturday, including seven First Place wins. Reporter Paul Thompson won four awards in a variety of categories in his first year with the Jackson County Advocate. Thompson took home the First Place plaque for Best Humor Columnist for three of his first-person commentaries: on being the “new guy”, meeting Ebenezer the donkey, and watching a rain-soaked Harry’s Hay Days Parade. Reporter Mary Kay Morrow took home three awards for her coverage of the Hickman Mills C-1 School District. Morrow also placed 1st in the state for Best Story About Education for “The Perfect Touch” about the opening of the Freda Markley Early Education Center. For Morrow’s coverage of the entire process of closing Hickman Mills High School, she was awarded third for Best Feature Series. His photographs of foreclosed homes in the Ruskin area took home First Place for Best Photo Illustration. In addition, his article was awarded Third Place in the highly-competitive Best News Story category. The staff of the Jackson County Advocate expresses its appreciation to all our readers and local businesses who make it possible for us to publish award-winning coverage of our community.